Roberts Revival iStream 3 review | What Hi-Fi? It’s been more than 60 years since Harry Roberts took a look at his wife’s handbag and decided to design a radio in its image. That the Roberts Revival has not only stayed in vogue, living up to its name over the past couple of decades, but also retained its position sonically as a class leader is little short of remarkable. That the Revival iStream 3’s continuation of a heady tradition came to us as no surprise is even greater testament to this company leading the way in household radio production. Roberts’ continued success is as much about following trends as it is setting them. As its name suggests, the iStream 3 caters for the modern pastime of streaming music as well as the more time-honoured one of listening to the radio. Of course, DAB, DAB+, FM and internet radio stations feature, but Bluetooth connectivity and built-in access to streaming services such as Spotify, Tidal, Amazon Prime Music and Deezer – as well as any NAS device on your home network and a host of podcasts – makes this very much a unit for the modern day. 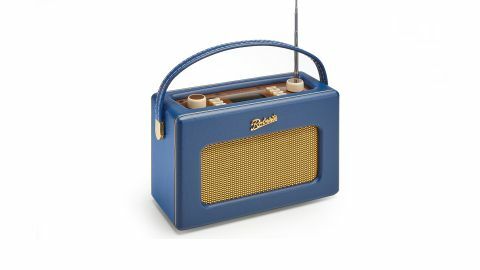 The design is of course in keeping with that which has seen the Revival radio remain in mode, a combination of chic elegance and vintage nostalgia. There’s a new colour option ­– Midnight Blue – which joins the White, Duck Egg, Pastel Cream and Black already in the Revival range, with each featuring a gold grille and ornamentation. All the action takes place on the top of the Revival iStream 3, which is dominated by a full-colour screen that takes you through set-up and displays the relevant information. There’s also a volume dial, which acts as the on/off switch, a 3.5mm headphone output and aux line in, USB input and pairing/mode, menu and info buttons. It also has buttons for presets, playback and alarm, a dial for tuning and source selection, and a pull-out aerial. For £200, the combination of connectivity, trendy design and fine build quality and finish feels good value for money, but it’s Roberts’ sonic presentation that makes the Revival iStream 3 an obvious choice for this budget. There is a six-position equaliser and separate bass and treble to tweak the balance – which can be manipulated within the UNDOK smartphone app – but we doubt that many will feel the need. The Revival iStream 3 has a warm, welcoming character, with focus on a rich midrange that celebrates vocals without rolling off the treble or packing in more bass weight than a cabinet of this size can properly handle. Timing and dynamics is where a lot of wireless speakers around this price – let alone a radio with a features list as long as this – leave us cold or, worse, irritated. The Revival iStream 3, however, is supremely competent. Music hangs together well, with better-than-decent organisation and an admirable sense of rhythm, while there is enough in the way of dynamic range to convey intensity and bring podcasts and radio talk shows to life. You’re not going to get a performance comparable with a dedicated wireless speaker like the Award-winning Audio Pro Addon C3 – don’t underestimate how much of the cost is going on the Revival iStream 3’s built-in services and connectivity – but you’d be hard-pushed to find a more enjoyable listen from a radio at this price. For that reason, we’d be more than happy taking one home. Six decades on, Roberts’s Revival radio line is still going strong.